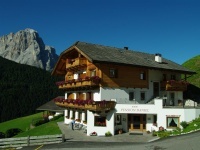 Our boarding house is situated in a beautiful place over Wolkenstein / Selva with a nice view over the Dolomites. In few minutes you can reach the town centre with your car. From the 24th December the skibus stops in front of the Pension Daniel.